A quick (except for fiddling with the balloon strings!) and bright birthday card. I used a touch of Ranger Multi Medium Matte on my finger tips to keep the strings in place. Supplies: paper – Heidi Swapp Minc paper, Neenah Classic Crest Solar White, Stampin’ Up! Pear Pizzazz, Real Red, Tangerine Tango, die – Taylored Expressions, embossing folder – Provo Craft, foil – ThermOWeb, embroidery floss – Iris. 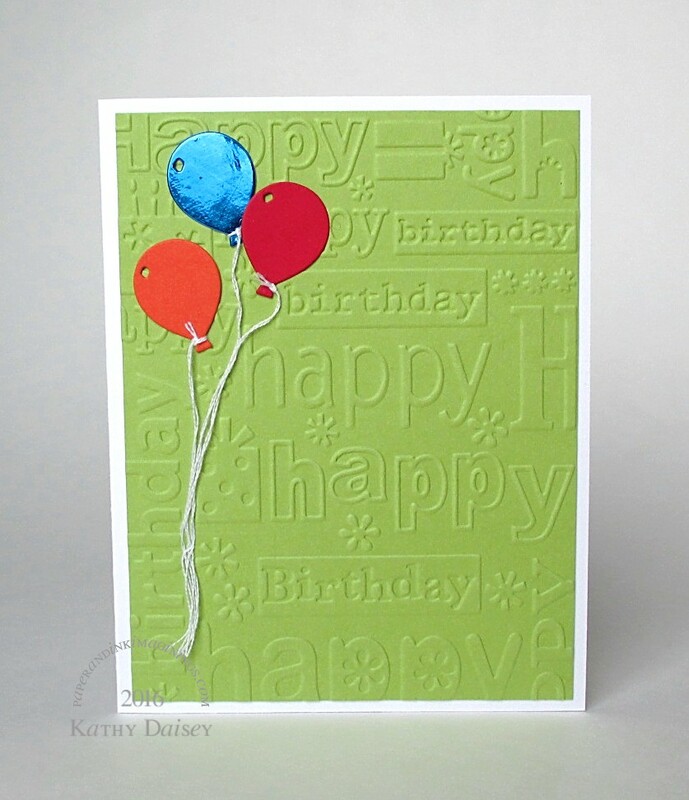 Categories: birthday, card | Tags: card, Heidi Swapp, Iris, Neenah, Provo Craft, Stampin' Up!, Taylored Expressions, ThermOWeb | Permalink. Nothing cheerier than a bunch of balloons! Love the colours again too. Nice for a grey November day! Sorry it was grey for you today…I have sunny, bright blue out my window here. Dark, grey, murky, rainy, cold, British…. We had murky gray showers yesterday…really reminded me of “California Dreamin’ ” by the Mamas & Papas (1960’s) if you are into music. I really like this. Could I have one with pink and yellow balloons? A nostalgic, wistful kind of card. Love it.